THIS IS ONE OF MY ALL TIME FAVOIRITE ROBES THAT HE EVER WORE, THE FAMOUS PEACOCK ROBE FROM THE LATE 70'S. 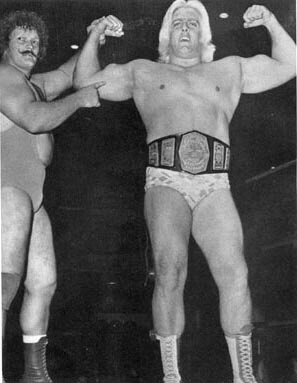 RIC FLAIR FLEXING HIS MUSCLES FROM THE MID 70"S, THE "NATURE BOY HAS NEVER BEEN KNOWN FOR HIS POWER BUT FROM THE LOOKS OF THIS PICTURE IT SURE LOOKS LIKE HE HAS SOME. THIS PICTURE WAS TAKEN FROM 1979 AT WRAL STUDIOS IN RALEIGH, NORTH CAROLINA, WITH THE NAITCH IS GREG "THE HAMMER" VALENTINE AND PAUL JONES. LOOK AT THIS RARE PICTURE OF RIC FLAIR AND RIP HAWK FROM THE SUMMER OF 1974, THEY WERE THE MID ATLANTIC WORLD TAG TEAM CHAMPIONS.THAT IS NOT A ROBE RIC HAS ON, IT IS A T-SHIRT THAT SAYS SILVER MOON ON IT. MY HAS TIMES CHANGED? THIS PICTURE IS FROM NOVEMBER 2001 WHEN RIC CAME BACK TO WWE AND HE CONFRONTED VINCE MCMAHON UNTIL STEVE AUSTIN CAME OUT AND THEN HE AND RIC HAD SOME WORDS FOR EACH OTHER UNTIL STONE COLD STEVE AUSTIN THREW THE "NATURE BOY" A BEER AND THEN HE AND STONE COLD HAD A BEER BASH TOGETHER. RIC FLAIR HAS HULK HOGAN IN THE FIGURE 4 LEGLOCK FROM 1991, THE MATCHES THEY HAD WHEN FLAIR FIRST CAME TO THE WWE WERE PRETTY GOOD MATCHES ONLY BECAUSE OF FLAIR'S GREATNESS TO SELL FOR HOGAN AND CARRY HOGAN THROUGH THE MATCH. RIC FLAIR HAS HULK HOGAN IN THE FIGURE FOUR LEGLOCK AGAIN. WHAT A JOY TO SEE THE "NATURE BOY" PUT THE MOST OVERRATED SUPERSTAR THE BUSINESS HAS EVER KNOWN HULK HOGAN IN THE GREATEST FINISHING MANEUVER OF ALL TIME = THE FIGURE FOUR LEGLOCK. 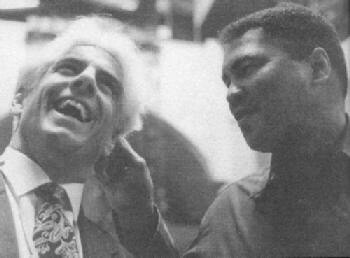 RIC FLAIR WITH "THE GREATEST" MUHAMMAD ALI FROM 1994. RIC FLAIR WITH A DIFFERENT HAIR STYLE. THE MOST FAMOUS CATCH PHRASE IN THE HISTORY OF SPORTS.